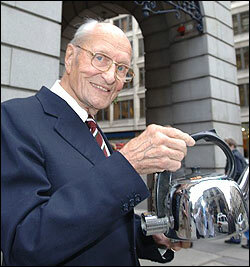 William (Bill) Russell (1920-2006) and Peter Hobbs (1916 - 2008) produced the first automatic electric kettle in 1955. Hobbs had gone into business with Russell in 1952, designing and manufacturing a coffee percolator that - for the first time - kept coffee hot, and also producing an automatic tea-maker to rival the Goblin Teasmade. 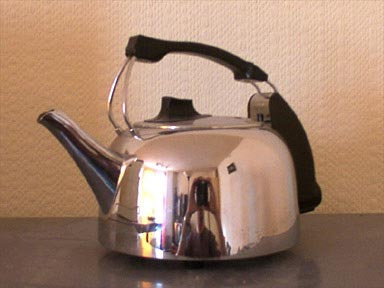 Their first automatic electric kettle, the vapour-controlled K1, appeared in 1955 and was superseded by the more elegant K2, a modestly curvaceous design originally produced in spun copper and polished chrome. 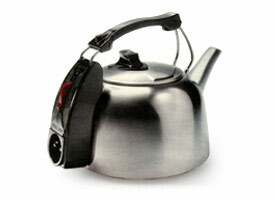 Before this kettle was introduced in 1955, boiling water by electricity could be a hazardous affair. Not only did some early electric kettles boil the water by making it live, if the kettle was not switched off in time, it could boil dry, which at best would wreck the kettle, and at worst could cause a fire. Later on, manufacturers introduced a variety of fail-safe methods to prevent this from happening. some kettles had replaceable fuses, whilst others had spring-loaded ejectors. At the rear of the appliance was a bimetallic strip, and when water boiled, steam was forced through an aperture in the lid to the strip, which knocked the switch off. It was simple but ingenious. 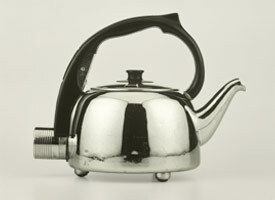 Even today examples of the K1 and K2 can be found in regular domestic use, proving it not only to be a highly popular design, but a most durable one as well. Peter Wallace Hobbs was born on May 3 1916 at Langton Green, near Tunbridge Wells Kent, England, and educated at the Skinners' school, where he was keen on drama. 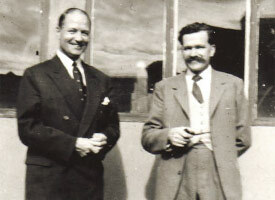 Working from a rundown factory at Croydon, Russell took charge of developing new products while Hobbs concentrated on sales.